Last weekend, Kris Abel from CTV News visited the Canadian Toy & Hobby Fair and got a good look at upcoming LEGO sets from the LEGO Canada display. He posted a lot of pictures (would have loved more from some of the Atlantis sets) and a lot of them I was surprised at. They were some of the first good photos I’ve seen of some of the unreleased sets scheduled for later in the year. * The 8077 Atlantis Exploration HQ looks to be shaping up well. 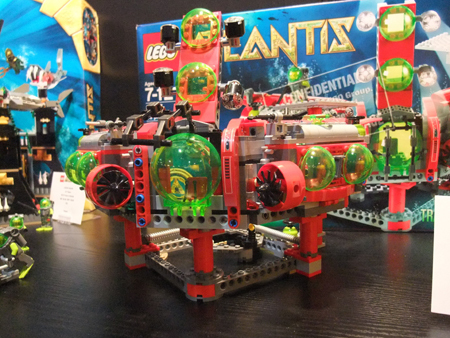 The first blurry shots I saw a while back made it look closer to the 7775 Aqua Raiders Aquabase Invasion. It looks to be a square-ish/self-contained structure which makes sense. I’m assuming the vehicles will dock on top. 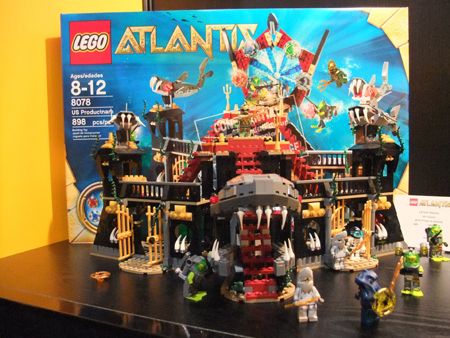 * The 8078 Portal of Atlantis (the infamous Shark Temple or Shark Castle) is bigger than I thought and looks to have a lot of really cool and unique parts. It’s hard to get a sense of the minifigs since they were mixed together with other sets. There looks to be some parts in colors that we haven’t seen before. The box shows 898 pieces but that’s obviously subject to change since it’s a prototype. I’m not sure on new minifigs – there is a skeleton with some diving gear on that has a trident symbol on their head. You can barely make out what looks to be the “turtle warrior” on top of the Portal, that’s been discussed in the past. * Kris mentioned when discussing the Space Police sets that Atlantis was the focus this year, hence the lack of a lot of new Space Police sets. As Kris notes, a lot of the upcoming sets are prototypes/mock-ups and details are not yet finalized. Nothing from Harry Potter and nothing new from the Toy Story line that’s not already out. I’m not quite as interested in the World Racers line or the Hero Factory line, but it looks like both could give us some new parts or older parts in new colors. Looking at the boxes for the World Racers, I think they’ll probably sell very well to the target audience. * 5893 Creator – Offroad Power (Pick-Up) that can be rebuilt as an off-road/dune buggy or a large tow-truck. * 7955 Kingdoms – The Wizard (Comes with what looks to be a little green dragon or owl plus a table and some potions/magic items). * Some Prince of Persia sets – 7570 Ostrich Race and 7573 Battle of Alamut as well as 7571 Fight for the Dagger. I’m very interested in these sets, but can’t/won’t talk about them at this time. Kris posted some shots of some Kingdoms sets, which is replacing the Castles series/theme. WOW! The main/flagship castle is awesome. It feels like some of the older sets, but there are sets that still tie it to the modern Castles theme such as the 7955 “The Wizard” which is reminiscent of 5614 The Good Wizard from 2008. There are red knights and green knights shown, and possibly a set or two that we don’t know the title/number to.